If you are a homeowner in Noblesville and you are experiencing water damage on your property, call 911 Restoration Indianapolis and they will let you know that everything is going to be okay. 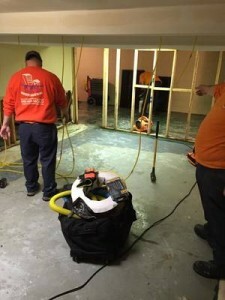 The water damage Noblesville team is here to ensure that we will fix whatever water-related problem you are having, no matter how big or how small. You can trust in the licensed, bonded, and insured team to give you a fair and honest free water damage estimate. Everyone deserves peace of mind after a home accident and you can count on us to bring you there. If you are in need of fresh start, then give the Noblesville water removal pros a call at 911 Restoration Indianapolis today! Pipe burst are responsible for a majority of claims submitted to insurance companies in the United States. In order to avoid this type of issue from happening in your home, the Noblesville water extraction techs want you to follow the steps below to keep your plumbing intact. The first thing a homeowner should make sure of is that their yard is clear. Roots from trees and shrubs, during the driers months, can burrow deep into the earth and find themselves in your pipes. The best solution for this is to replace metal pipes with newer ones out of PVC. Another solution is to use plants that have shallow root-systems. They will grow out wide, and not down. Another reason why pipes can become compromised is due them freezing over in the winter. A simple way to prevent this is by keeping them warm. This can be done by either giving them more insulation, or providing them additional heating. The heating can either come from the home’s HVAC, or from something like a heat lamp. If you do experience a pipe burst, then the first thing you should do is shut the water off to your home. This will keep the gallons of water from spilling out into your property. Then make sure to call the Noblesville flood cleanup crew. We want all of our customers to know that we have you covered from start to finish. If your store or home is filling up with liquid of any variety, then contact the water damage Nobelsville team with 911 Restoration Indianapolis for help today! 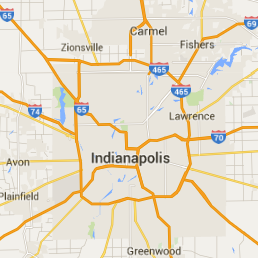 911 Restoration Indianapolis requires every Noblesville water damage mitigation technician they employ take rigorous courses. This better ensures that our customers’ homes will be restored to its former glory. With years of experience behind them, they can handle any and all home related work. 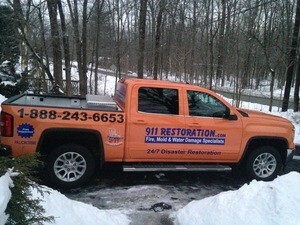 It is our promise that our job will be thorough and affordable in order to restore both your home and peace of mind. 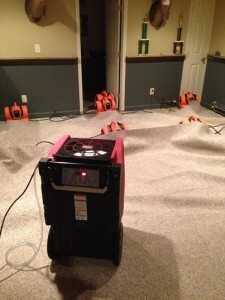 Our Noblesville water damage cleanup agents always vacuum out all standing water. Pooling moisture can give rise to microbes and mold. This will prevent future damage. Furthermore, after we remove excess water, we run dehumidifiers. This increases the rate at which water locked in fibers or porous material will evaporate. This strategy will keep mold from spreading or growing elsewhere. 911 Restoration Indianapolis will get you back into your home as soon as possible, so call the water damage Noblesville team today!